St. Mary Academy - Bay View is an independent, Catholic school serving a diverse population of girls from preschool through grade twelve. In the tradition of the Sisters of Mercy, we foster academic excellence in an innovative and creative learning environment. We are committed to empowering each student to be a confident, independent, compassionate and socially conscious young woman who fully lives her faith. St. Mary Academy - Bay View was founded by the Religious Sisters of Mercy in 1874. Bay View’s campus is located in Riverside, Rhode Island, five miles east of the state Capitol building. For 2018-2019 academic school year we have a strong student enrollment of 540 plus girls and young women in preschool through grade twelve. Middle and Upper School students are selected on the basis of a rigorous entrance examination as well as superior academic achievement. Students are drawn from cities and towns throughout Rhode Island, Southeastern Massachusetts and Northeastern Connecticut. The Academy also enrolls international students through a variety of international agencies, providing both dormitory and host family housing. Bay View welcomes and appreciates the community enrichment that ethnic, cultural and religious diversity provide. 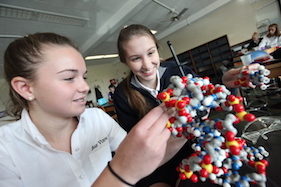 In the tradition of the Sisters of Mercy, we foster academic excellence in an innovative and creative learning environment in order to empower each student, from preschool through grade twelve, to be a confident, independent, compassionate and socially conscious young woman who fully lives her faith. This mission is carried out in developmentally appropriate ways across the three levels, and all are targeted to girls...the way they learn, play, grow, relate and thrive. 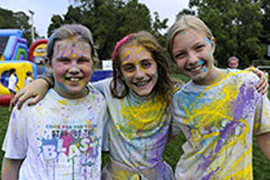 Lower School (Preschool through Grade 5), Middle School (Grades 6-8), and Upper School (Grades 9-12). The curriculum, like the mission, is based on an all-academy approach. 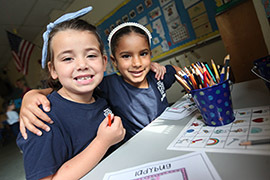 Each subject area, from science and mathematics to world languages, performing arts and physical education, is incorporated beginning at age three and progresses until our students graduate from the Upper School. "There is nothing more conducive to the good of society than the education of young women." *Highlights taken from “Steeped in Learning: The Student Experience at All-Girls Schools,” a comprehensive report prepared for NCGS. 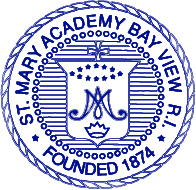 St. Mary Academy - Bay View is a member institution of the Mercy Education System of the Americas, a sponsored ministry of the Sisters of Mercy. 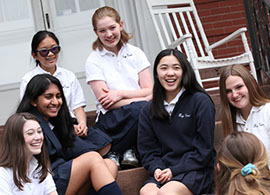 In existence since 1874, Bay View endeavors to provide a quality education preparing girls and young women for the challenges of the global community.